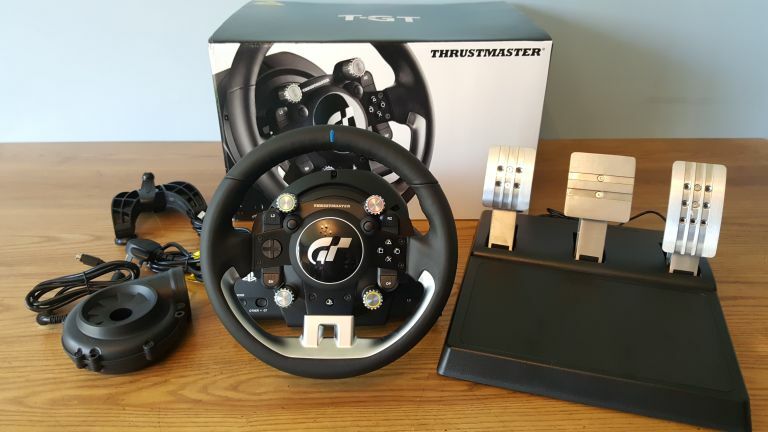 T3 is currently testing out Thrustmaster's new T-GT racing wheel for PS4 and PC, a £699 super premium offering that has been built specifically with the upcoming Gran Turismo Sport racer in mind, delivering a - quite honestly - insane package that takes the concept of video game accessory to a new level. A full review of this advanced wheel is coming later in the week here on T3.com, however, in the meantime here is an unboxing video showing you what you get in the T-GT package up close. As you can see from the unboxing video, Thrustmaster really isn't messing around here, and for that super-high price it really shouldn't be. No, the T-GT is a serious piece of kit for those looking for the most authentic racing game simulation experience possible right now and, from our limited time with the wheel so far, we have to say we are very impressed with its performance. The oh-so-crucial proper detailed testing is still to come though, so do be sure to check back in later on in the week to get our full verdict. If you can't wait that long and want more details now though, then you can head on over to the wheel's own dedicated website.